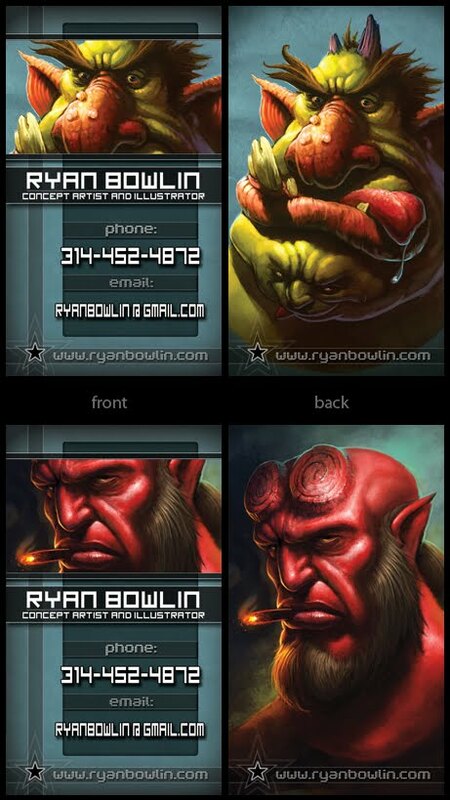 Work is still under way on the Zelda piece but I took some time to make up some new business cards for the new year! I'll be at a Con this month and just wanted to have something to hand out to all the new, awesome artists I'm hoping to meet! I couldn't decide on which piece to use so I figured I'd do a print run of both! Maybe in the future I'll do more with other art pieces to make a little set. You could collect them all! Ha! ;o) May there be much more awesome art made in 2012! Happy New Years! 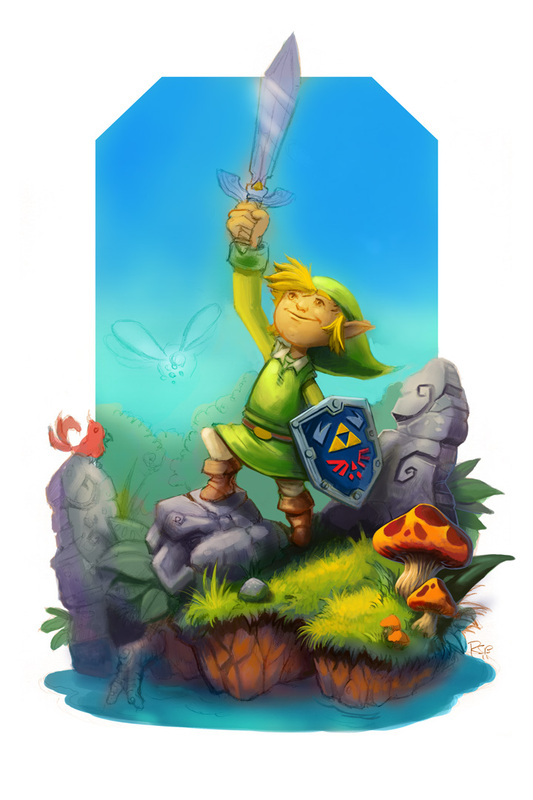 The progress on my Legend of Zelda illustration has been slow going since enduring the holidays and the acquisition of a fiesty, little puppy. Ha! But I'm going to try and find the time to finish it over the next week or two. I haven't said much about it since I've been so busy. But I figured it would probably be good to address it for the sake of continuing to document the process! I still have quite a bit of work to do but it's shaping up a bit since the last time I showed my initial color pass. Hope you guys like where it's going! I'm going to throw my efforts behind this image and hoping to get it done soon so I can get some prints made in time for my trip to GigaCon in mid January. More on that later though! Hoo Hoo Hoo! Merry Christmas! 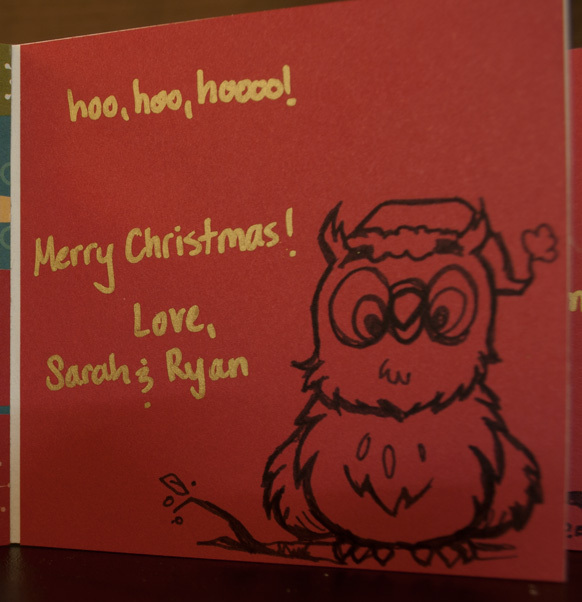 This year my wife and I made our own Christmas cards by hand to send out to a few of our family and friends. In each card I hand drew a unique owl. This is a sampling of some of those owl scribbles! 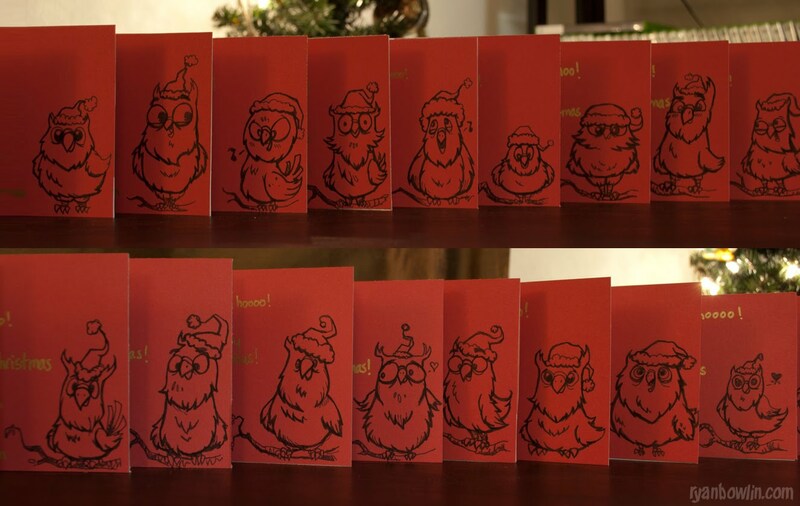 They were a hoot to do (See what I did there? Ha!) and it was neat to see how each one could be a bit different then the next. I hope you like them and I wish you the best as you continue celebrating into the new year! Here's a little pen scribble that I did while in a meeting at work today. Christmas is just a few days away! What's Santa bringing you?! I swear I'm going to get back to drawing and painting soon! Haven't had as much free time lately so doing these quick little sketch sculpts have been a nice change of pace. This Ogre was another one done in Sculptris and I think he's the best of the three I've done thus far. I gave up on trying to make his hairy chops look believable though. Been having a blast playing with shapes in these! Hope you like him! So I'm not sure if it's a good idea or not to share these little 3D sketches with you guys. I don't ever envision myself moving completely that direction but it is a fun way to push my art brain around in a different way. I basically have just been exploring these things the same way I do random sketches in a sketchbook. I just start laying in shapes and push and pull it into something. Their a blast! I start all of these with a basic sphere and just go to town on it. 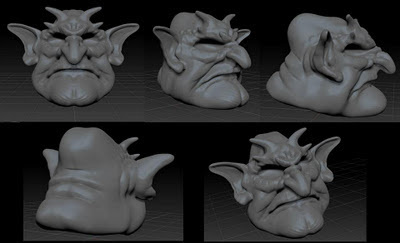 I was a bit let down by the price for ZBrush but my friend (Casey Dockendorf)commented on my last post and alerted me to Pixologic's free gateway drug into ZBrush, Sculptris! It's awesome and just powerful enough to do what I want to with it! Check it out and toss some virtual clay around! With the new puppy in the house it's been slow for art production. Hopefully the holiday break coming up will help me out. We shall see! 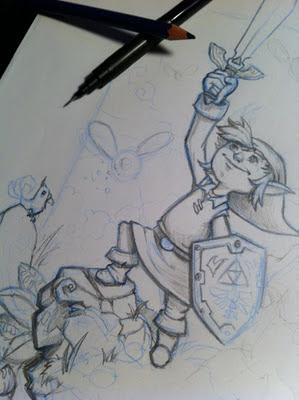 Really want to finish that Zelda piece and I might push back the Snow Moose into January. This dog has turned our life upside down. lol Puppies are a LOT of work. Anyway, thanks for lookin' over my scribbles! And take care! We're starting Z Brush training at work so I figured I'd show off my first ever sculpt! It's kinda crude and amateurish but I'm quite impressed with how easy it was to grasp some of the basic tools. Might work on this dude a bit more as we keep learning! Just wanted to share! By no means am I a 3D artist but it is fun to mess around with from time to time. Perhaps I'll have more ZBrush sketches as time goes on. It is a very interesting tool to mess around with. I don't think I'll become a ZBrusher but it's fun to mix it up every once in a while! Just wanted to share! Hey blog peoples! Hope you're enjoying your December! I know I am! It's been super busy but I'm trying not to completely abandon my art efforts. Yesterday I scribbled out this goofy sketch of The Penguin after discussing with some friends how disappointed I was that Bane was going to be the main villain in the newest Batman. I'm just not that fond of him when compared to all the other great villains that Bats has been thrown up against! So I did a quick scribble and spent about another 15 minutes throwing some layers at him to add a dash of color/texture. Pretty far off from a finished painting but I hope you enjoy it nonetheless! Maybe I'll paint him up proper some other day when I have the time. I'm still making headway on my Zelda illustration but it might overtake my holiday illustration of the Snow Moose or push him back into January. The big reason is the wife and I have decided to get our first puppy! We've been in preparation mode for the little one and it's been nuts around here. I'll post a pic of her below so you can "ooo" and "awww" with us! Ha! 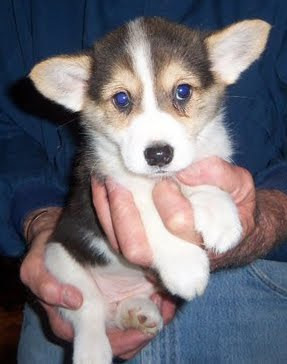 Corgi's FTW! I know it isn't much but hopefully I'll have more updates as the days spin on. Looking forward to getting some work done over the course of the holiday break too! So keep checking back and thanks for looking! Take care! Started digging into the painting today so I figured I'd upload a small update on the final drawing. I also thought it might be nice for you to see how this image started so I've posted an image of the initial thumbnail where it all began. I try to work really loosely in that portion of the process and really just nail down basic shapes, compositions and poses. I think I have more fun exploring options there then at any other place in the process! So much promise in these little scribbles! 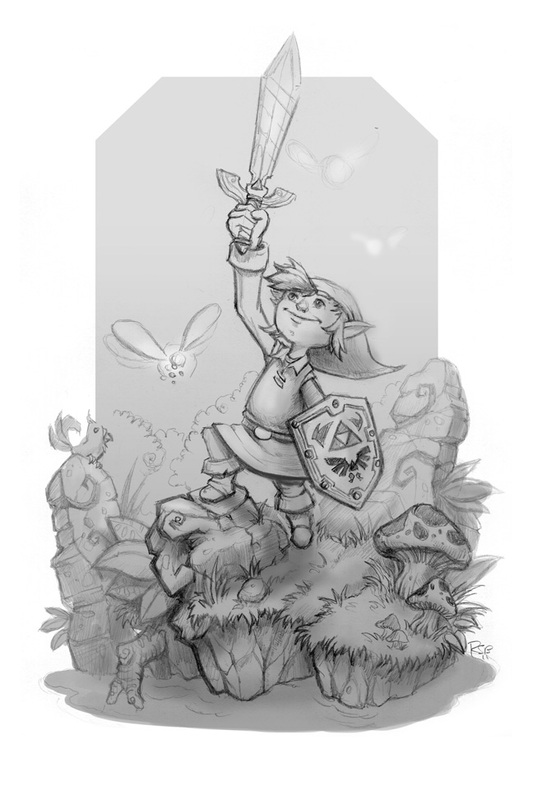 The second image is a rough value pass on the lines for my Zelda illustration. I almost always do this before jumping into a painting. It tends to help ground some of my ideas for me. At times I'll really push this part further and spend a lot more time rendering. Value and lighting is important and if I forget that I usually will loose all of my contrast in a piece. I need to make sure I remind myself of that as I continue since I didn't push it much in this one. And lastly, I figured I'd toss up my first, initial wash of colors as well. These two phases kind of go hand in hand. 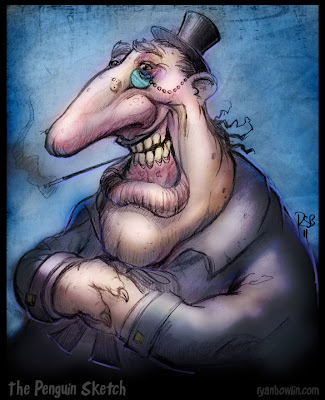 After I do a value pass I create wash of the overall colors I want in the image. 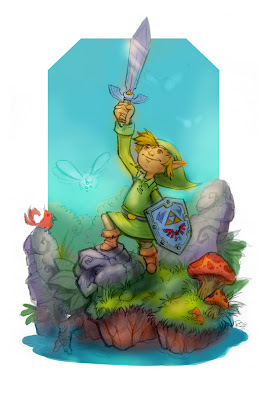 It's just a color layer with a few overlays and BAM! You've got some color to start working with! It's neat to see how a little color really starts to make the image come alive. I'm much further along then this now though. So next update should be with a nice coat of paint on everything. I might wait a few days before I do that though. Or I perhaps might wait until it's completely finished. We will see! Hope you guys like it! I'm excited to see where it ends up! Just wanted to share this really quick. Here's a sneak peek at the pencils for my Legend of Zelda 25th Anniversary tribute illustration. I'm a huge fan of the series but I've never created any fan art. Really excited about this one! 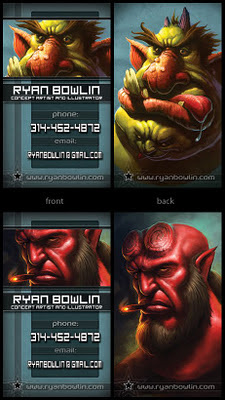 Also don't forget to like and share my Facebook page for a chance to win some original Mega Man art and a Hellboy print!